Why is it that some people are more curious than others? Is it because of our parents or our biology? Do we get more or less curious as we get older? Why is this? These are the questions that Ian Leslie seeks to answer in Curious: The Desire to Know and Why Your Future Depends On It. Some of the book is anecdotal but most of it delves into the science and sociological factors behind what drives the curious in a very approachable way. Rather than review this in the typical way, I am going to share a few of the takeaways I learned from it, instead. Curiosity comes from an information gap – you are more interested in learning about something you already know a little about than to be curious about the things you know nothing about. The best place to be is in the proximal learning zone, or the place between knowing something and knowing nothing about a subject. The more you learn, the more you broaden your base and, therefore, the more curious you become. Curiosity is also masochistic – it’s painful not to know something. Curiosity can trump self preservation, which is why kids will pick up a gun even when they have been taught that it’s dangerous. 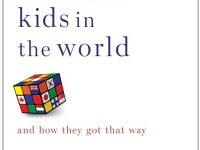 Sadly, many kids lose their curiosity, which can be attributed to a number of factors, including parents. The truly curious have no idea how much they want to know. The Internet is great and horrible at the same time. Google has the ability to put vast resources at your fingertips for extensive research, but it also offers quick and easy answers. This is great for the truly curious but not great for the average person because the harder something is to learn, the more likely you are to remember it. We should all strive to be foxhogs. Recommended for: Readers who are curious about what a foxhog is.